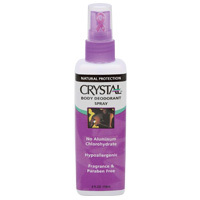 Now get the odor-preventing power of Crystal in a convenient Body Deodorant Spray. Safe enough to be used anywhere on the body to control odors – including feet, chest, and inner thighs. Hygienic bottle design allows use by more than one person. Purified Water (Aqua), Natural Mineral Salts (Potassium Alum). Contains No Aluminum Chlorohydrate | Aluminum Zirconium | Parabens| Phthalates.